Everybody loves Winnie the Pooh and his adorable addiction to honey. It's often believed that the children's book character is based on a teddy bear that the author, A.A. Milne, gave to his son Christopher Robin Milne. But this is only partially true. In fact, Christopher Robin named his stuffed bear after a real bear named Winnipeg, or Winnie for short. The bear's name came from Lieutenant Harry Coleburn's home town in Manitoba, Canada. Coleburn bought Winnie for $20 after a hunter shot the cub's mother, and Winnie quickly became the unofficial mascot of the young soldier's regiment. When Coleburn shipped out to England to fight in World War I, he hid Winnie on board. Winnie did not actually fight in the war. 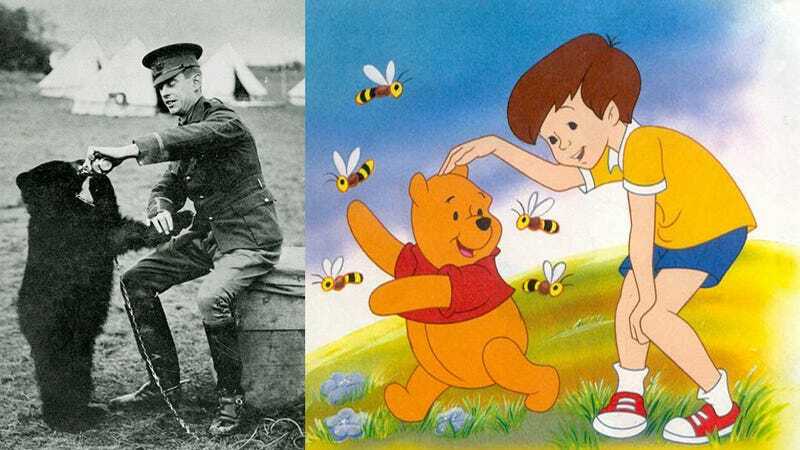 She—yes, Winnie was a she—boosted troop morale just as other mascots did during the war. Winnie would go on to inspire generations of young children, albeit in the form of a yellow bear that loves honey.